Although Joomla is a highly sophisticated and popular content management system designed to power a blog or website of almost any type, it is certainly not for everyone. If you are among those who have decided to make the switch from Joomla to a WordPress website or WordPress blog, the latter powering almost a quarter of the world’s websites, the process is fairly straightforward thanks to the availability of plugins that can help you. Before you get started, you will need to choose a hosting company and install WordPress. For best results, go for a hosting company that provides a simple one-click installation for WordPress, which make install about a simple as using a website builder. 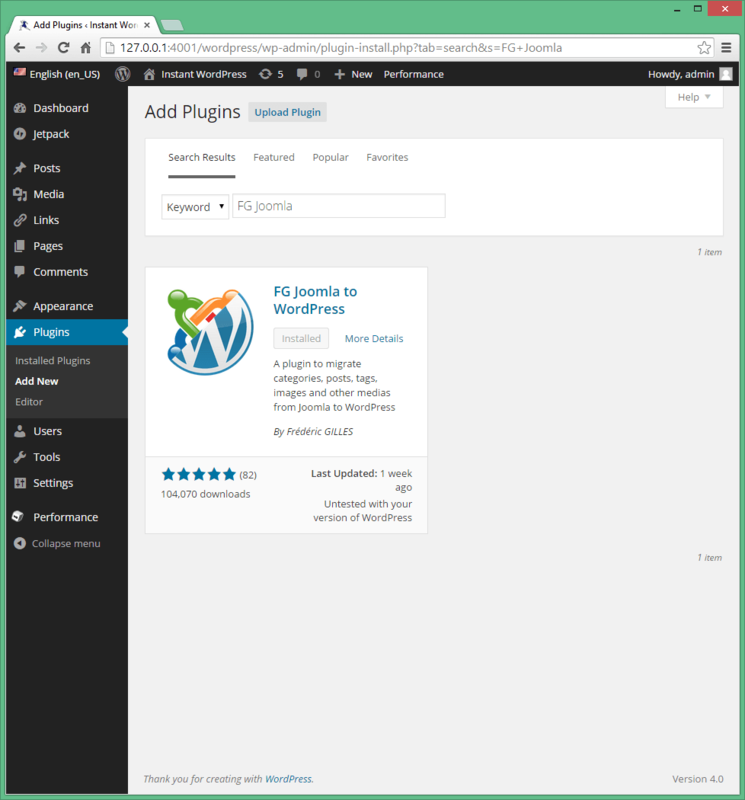 Although there are a number of plugins available for WordPress that greatly simplify the process of migrating from Joomla, we’ll be using the popular FG Joomla to WordPress plugin for the purposes of this tutorial. Navigate to “Tools > Plugins” in your WordPress administrator dashboard, and enter the plugin referred to above in the search field. Click on “Install Now,” click “OK” to confirm, and click “Activate Plugin” once the download and installation is complete. Now that you have installed the plugin, a new option will appear in the import settings in your administrator dashboard. By using this plugin, you will be able to import categories, posts, images and attachments from your Joomla database into your WordPress one. Navigate to “Tools > Import,” and click on the Joomla FG option from the list of import options. The Joomla import page will open. Go to the administrator section of your Joomla website, and note down the database settings, or keep the page open alongside your WordPress administrator dashboard for reference. Enter the database parameters, including the hostname, port, database, username, password and table prefix back in your WordPress administrator dashboard. Check the box beside “Force media import” if you want to transfer images from your Joomla website as well. 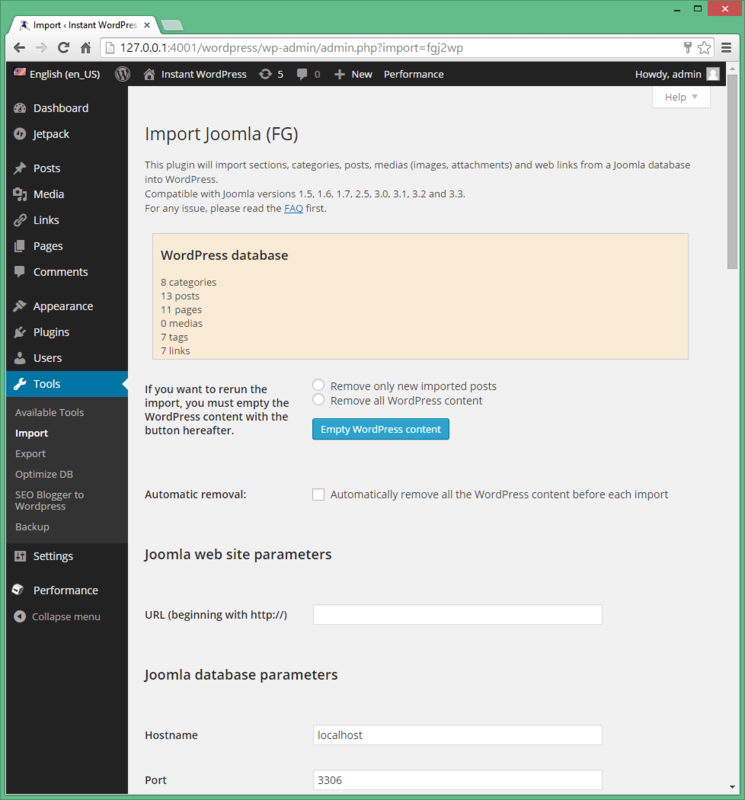 Click “Import content from Joomla to WordPress” to continue. The process may take some time, depending on the amount of content on your Joomla website. Click on “Modify internal links” once the migration is complete. You should skip this step only if do not have any internal links in your Joomla website pointing to other pages on the website. There is also a premium version of FG Joomla for those who need to import additional content, such as that from outdated versions of the CMS, contact directory contacts and Virtuemart e-commerce content.